According to people who should know, the last goats were removed about twenty years ago. It may have been more than 20 years but they are now ensconsed on Eilean Duin and are surviving very well! How many are there on Eilean Duin ? I've never noticed them when sailing past, but then I've never remembered to really have a good look. I presume they must be breeding? I would have thought it is a very small area to sustain a breeding population. Apart from the original questioner, and Dedboring whose entry is ambiguous but has suggested a referendum connotation, the contributors have all included their YES credentials. But the subject is about goats. It may be a bit wide of the mark on keeping to the thread (with the threat of banishment if deviating), but I would have suggested that 99% of the residents hereabouts have not the foggiest idea of where Eilean Duin is, or were even aware of it's existence. 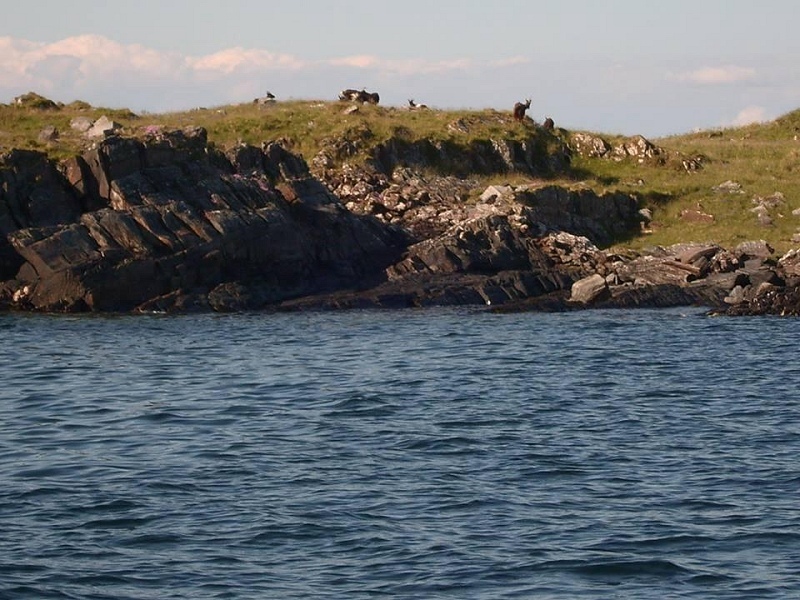 Some photographic evidence of this goat infested island (Eilean is gaelic for island) would make a welcome addition to these pages for those who follow the entries herein with bated breath. I would have suggested that 99% of the residents hereabouts have not the foggiest idea of where Eilean Duin is, or were even aware of it's existence. I suspect you are way out on your percentage there Jim, and that most people who have lived here for long do in fact know where Eilean Duin is. It is the island NW of the entrance to Puilladobhran with a big square rock formation on top that gives the appearance of a castle from a distance. As I remarked before, we have sailed past it on many occasions and never seen any goats. If they are no more then perhaps the island could be repopulated with some of the Loch Lomond refugees. Nick, there are about 12 - 16 goats out there and they are breeding. 20 or so years ago they were not culled but herded up and shipped off to the island by the then owner of Ardencaple Estate. I would imagine the present owner would have to be consulted re any repopulation! I've tried unsuccessfully to photo them from our boat and they were certainly there at the beginning of October this year. In the summer, with all the growth, they are very difficult to see but now should be a dawdle. They're often seen at the rockier sw end - do I hear an expedition in the planning? Just a wee add on to this topic. The goat herd that occupied ground around Dunmor farm up until the 2nd world war were reputedly shot to provide a meat source during the war years, apparently by a local who had evacuated from Dunkirk, and as such it would be hard to justify critisism for this slaughter. Goats were reintroduced to Dunmor in the early seventies in an attempt to have the dangerous cliff areas grazed and therefore prevent sheep from falling to their deaths. These goats displayed a discernment, which hopefully the voting public will employ, and mainly grazed on the lower lush fields of Dunmor. Subsequently they were removed to Eilean Duin to keep company with the solitary 'Annie Fanny', a hand reared feral goat named after an infamous prostitute of the period, caught plying her trade at Glasgow airport. Dedboring, despite a local knowledge of goat history and movements seems determined to hijack this thread into the referendum camp which is a pity. 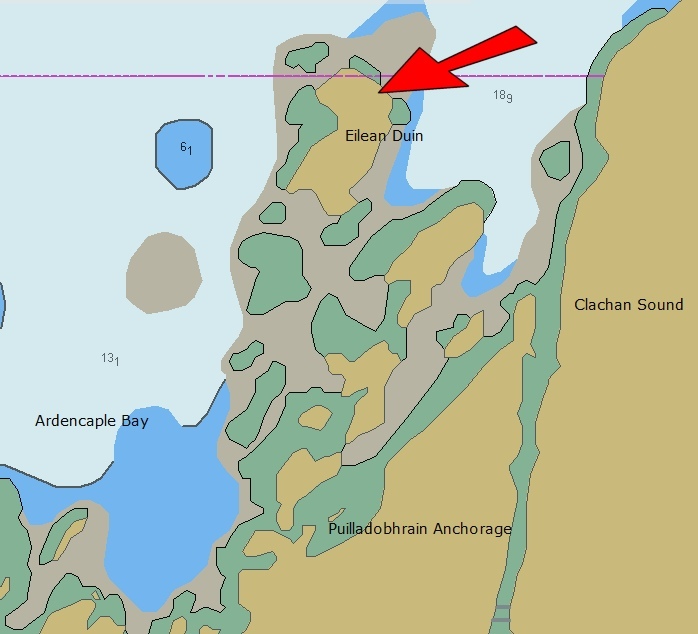 Others in the sailing fraternity are showing off their knowledge on the whereabouts of Eilean Duin, but they are still in the minority of the residents of this island and are certainly not knowledgeable about the wildlife therein as it is not a favourable visiting destination. The drummer is the only one who speaks with any authority on the subject, and while not decrying any of his pronouncements, some factual numbers and photographic proof of same would be a very interesting and welcome addition to the knowledge of the wildlife in our immediate vicinity. Apropos of a different matter entirely - what is the significance of AYE? You seem to be obsessed with the referendum. There is a separate part of the forum to discuss this. This thread is about goats. Please try to stay on topic. As to knowledge of Eilean Duin - in case you hadn't noticed, the sea is all around us. Many locals either have a boat, make a living from fishing or have done so in the past. Knowledge of the immediate coastline is pretty widespread around here. Dedboring's contributions to this thread have been very interesting. It is always good to hear some local history, especially when it is something as quirky as the story of the Dunmor goats and Annie Fanny. Welcome back Dedboring from your long slumber. Not sure who this drummer chap is but here I go again with more info re the goats on Eilean Duin. I happened to mention in a recent conversation about photos of the animals and was told I would be emailed one of the creatures at the SW corner. Numbers unknown! Photo to follow. D/B, your story of Annie Fanny is much more intersting than the one I have. There was a hand reared goat called the above who was raised in Clachan Seil from a kid. But as she grew older and much bigger she would jump her fence and go off to sample the fare in the neighbouring garders. She was often on the road and from time to time in TnT! The owner of poor Annie decided that banishment to Eilean Duin was the answer and not to resort to the many curry recipes that were offerred. There were already the Dunmor/Ardencaple goats on the island when she arrived. You can tell me, or us all on here how you are so knowledgeable about the other far more interesting Annie Fanny - The nation awaits! - it's the nearest I could get to a goat! A photographic safari of Fanny Anny, friends & relations is called for, methinks. Selkie, the community skiff, is at your disposal. We rowed past the island a couple of weeks ago, on the east side, but didn't spy any goats (but to be honest, we probably weren't looking). All we need is a good tide, good weather - and daylight! Please can I do a posting without being hauled over the coals? I also remember looking out for the goats at Dunmore each morning from the school bus but surly it wasn't that long ago!!! I think there are stories of Annie (goat Annie) playing the piano at the pub...perhaps drummer man can elaborate if he knows the relevant anecdotes??? Feral goats on Scarba, too. .....................Rhu Fiola, Jura, Islay, Mull etc! 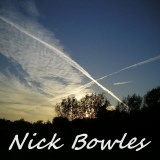 Photos taken sometime end of Aug/beginning Sept during futile fishing trip. They were on the rocky SW'ern tip of Eilean Duin. If landing on the island you'll find them very difficult to approach - we must smell even worse than they do!! The community skiff, Selkie (with crew of five plus ship's dog), rowed to the island today for a Midsummer Day's picnic and goat-spotting expedition. There were 12 goats on the island, spotted from 'Submarine Hill' in the centre of the island; two billies, two kids and the others were yearlings/nannies. They were actually on the northwest side of the island today - too much waist-high bracken at the southern end methinks. Rather skittish, but I guess they don't see many folk up close. 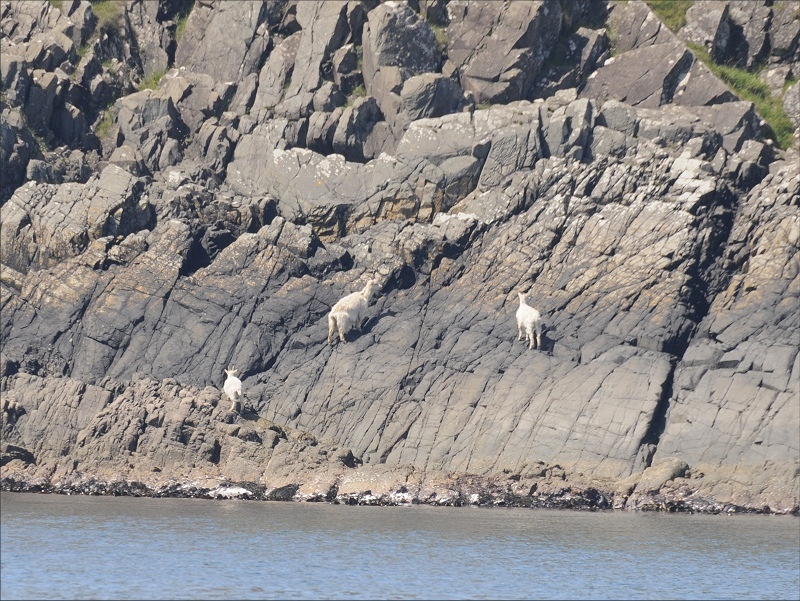 Your trip to Eilean Duin in Selkie hopefully produced some photographic evidence of our feral goats - unfortunately too late for next year's Slate Island Calendar, but there is still the opportunity of having something in the SELKIE calendar if approved. Long lens, but very distant - not good enough for the calendar, I'm afraid, but proof positive of their continued existence this year on the island!